Nashville, TN – April 1 2019 – The NADCA 30th Annual Meeting & Exhibition was held in downtown Nashville drawing more than 600 HVAC duct cleaning professionals to the Music City Center convention complex. 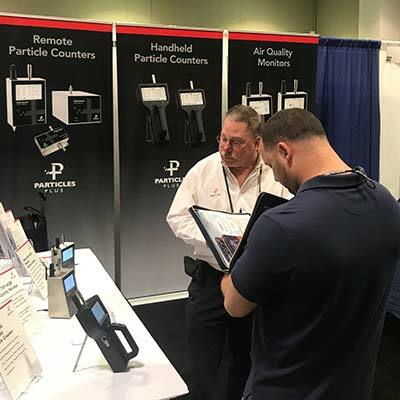 Particles Plus attended and exhibited at the event providing product demonstrations for their line of advanced particle counters. “The instruments offered by Particles Plus can count airborne particles with the highest concentrations capable for an optical handheld particle counter. The ability to take the instrument on a site with high concentrations and its long battery life make it an excellent tool for the duct cleaning professional,” noted Jim Akey, Sales Manager for Particles Plus. He also shared, “The Real-Time Meter function, unique to the Particles Plus product, is an ideal tool for Duct Cleaners providing audible and visual indication of registers and ducts that are emitting particulate helping to pinpoint particulate sources during the project. Using a particle counter provides for a baseline measurement of the air quality in a property. This baseline can then be compared to the post remediation air samples to determine the effectiveness of the cleaning event. Professionals involved in remediation or air duct cleaning should be able to quantify and document their effectiveness with the use of a particle counter or air quality monitor.